Google has informed developer members of its Glass Explorers team that the first wave of Glass prototypes is ready to go out to them. Anandtech’s Brian Klug received an email from the company that said the hardware and software are ready and the “first few devices” are coming off the production line. Though there aren’t enough yet for all Explorers, Google is going to send them in batches, notifying members as they’re ready. “We know you’ve been standing by patiently to get Glass. So, instead of waiting for all of the devices to be ready, we want to start delivering them to you now,” the email read. It’s not clear from the email how exactly the lucky Explorers will get their hands on the devices, though. The company has said in the past that members will be able to pick up the eyewear at special Glass events in New York, San Francisco or Los Angeles, but the email to developers suggests that there might be a shipping option for them as well. “When the time comes, you’ll receive an email with all the details,” Google told developers. Earlier reports suggested that Google Glass is being manufactured in Silicon Valley. If true, shipping should be a relatively straightforward affair for the search giant. The first batch of Explorers is the 2,000 or so attendees from last year’s I/O conference that pre-ordered the prototype. All Explorers will have to pay $1,500 for the device. 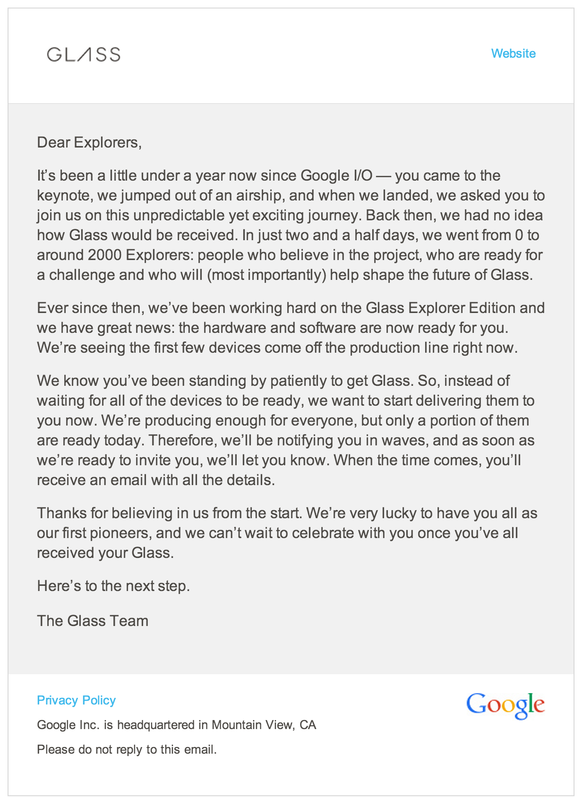 Late last month, Google also began sending Explorer invites to winners of a social media contest that asked users to share what they would do with a Glass device, though it revoked some of them after it realized that not all of the winners were eligible to take part. It’s been a little under a year now since Google I/O — you came to the keynote, we jumped out of an airship, and when we landed, we asked you to join us on this unpredictable yet exciting journey. Back then, we had no idea how Glass would be received. In just two and a half days, we went from 0 to around 2000 Explorers: people who believe in the project, who are ready for a challenge and who will (most importantly) help shape the future of Glass. Ever since then, we’ve been working hard on the Glass Explorer Edition and we have great news: the hardware and software are now ready for you. We’re seeing the first few devices come off the production line right now. Thanks for believing in us from the start. We’re very lucky to have you all as our first pioneers, and we can’t wait to celebrate with you once you’ve all received your Glass.